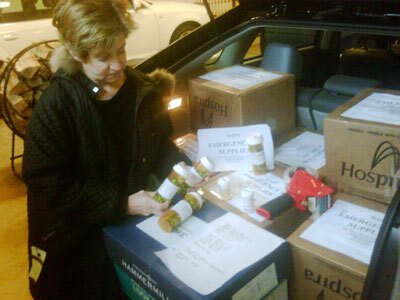 Last night I loaded up the boxes with Karyn, and then with the help of the agents at Delta, got the ten heavy boxes of supplies down to southern Florida. Our medical team of ten departed for Haiti at 6am this morning. Haiti is different than the last 2 disasters I responded to. In the tsunami and Katrina, most died quickly of drowning. In Haiti most of the injuries are due to the crush of the collapse of structures, with broken bones common. Infection and shock (low blood volume) set in quickly, thus the need for fluids and antibiotics. Centennial has offered a great supply, but we need more. Hopefully in the next couple of days we can get a plane load into the hospital there to meet this critical need. As I can, I will be blogging daily to report what is happening on the ground. I invite you to visit www.billfrist.com and www.hopethroughhealinghands.org to learn more about the disaster of Haiti over the course of the next week. Frist packing supplies with Centennial Medical Center pharmacy staff. 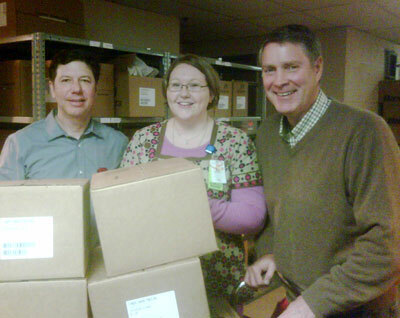 Karyn packing boxes with Dr. David Allen at Centennial Medical Center. We welcome donations: HAITI DISASTER RELIEF FUND. Posted with permission from Hope through Healing Hands.